VOLUMA Juvederm, the newest product of the Juvederm family, is a facial filler with hyaluronic acid (HA). First of its kind, it is specially designed to restore lost volume in the middle of the face due to aging, particularly in the cheeks, cheekbones in and around the chin. As JUV�DERM VOLUMA uses hyaluronic acid, sugar naturally present in the skin layers, it can instantly restore the dermal volume in the cheeks and redefine the contour of the chin. Juvederm VOLUMA also combines with collagen and elastin to improve the structure and elasticity of the skin and give it a smooth appearance. The results are instant, natural-looking and can last up to 18 months. Moreover, there is no recovery time, most people resuming their normal activities immediately. Hyaluronic acid is used in aesthetic medicine as a wrinkle filler. It is injected into the skin, in the form of a transparent gel intradermally. It creates volume by giving a semblance of vitality, good health, or look under .Inject� brilliance of a wrinkle, hyaluronic acid plumps the tissue and gives the skin its smooth, natural and tense. Processing a ride by the injection of hyaluronic acid is generally easy, the results are visible immediately and leave no scars. 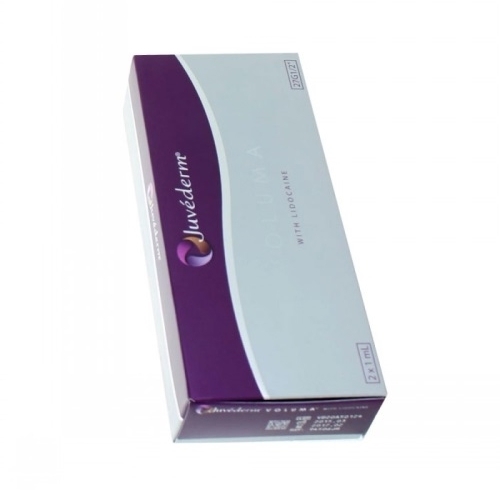 Attention injecting JUVEDERM Volumea LIDOCAINE 2x1ML requires a medical procedure that can only be performed by a physician (doctor specializing in dermo-cosmetic dermatologist, plastic surgeon). PRODUCTS SOLD ON OUR SITE ARE PARAPHAMACEUTIQUES PRODUCTS, THEY ARE THEREFORE OVER-THE-COUNTER AND DO NOT REQUIRE A PRESCRIPTION. Store the injectable implant in its packaging at controlled room temperature between 2 �C and 25 �C. Do not use the product after the expiration date. The expiry date is printed on the product labels. Attention injection of Juvederm VOLUMA LIDOCAINE requires a medical procedure that can only be performed by a physician (doctor specializing in dermo-cosmetic dermatologist, plastic surgeon). Indications: restoration of the volumes-face, injection by qualified medical personnel in accordance with applicable local regulations.